At a Friday rally in front of 26 Federal Plaza Congresswoman Yvette Clarke compared government agencies to the Gestapo, and likened Trumps’ policies to those of the Nazis, drawing swift and bitter condemnation. On the eve of Holocaust Memorial Day congresswoman Yvette Clarke (D-Brooklyn), whose district includes Crown Heights, set off a firestorm after incendiary comments she made at a rally outside 26 Federal Plaza in Manhattan. “We’re standing in front of a building that has become the headquarters for the Gestapo of the United States of America,” Rep. Yvette Clarke (D-Brooklyn) told a crowd of about 50 at a rally in Manhattan’s Federal Plaza. “We will not sit quietly as [Trump’s] administration attacks hardworking people who contribute positively to this country,” Clarke said. Clarkes comments came at a rally against the deportation Ravi Ragbir, whose Jan. 10 detention led to the arrests of city council members Jumaane Williams and Ydanis Rodriguez. The congresswoman’s comments are particularly troubling and offensive coming on the eve of Holocaust Memorial Day, and given that a large number of her constituents include the Jewish residents of Crown Heights – many of whom are the descendants of holocaust survivors. “Unacceptable! As a fellow democrat I call on [Rep. Yevette Calrke] to apologize for her comments on Holocaust Remembrance Day,” said community activist Yaacov Behrman. Adem Bunkeddeko, who is challenging Clarke in the upcoming primaries, called her remarks deeply insensitive and does nothing to help meaningful immigration reforms. “Trump’s immigration policies are a disaster and an attack on our core American values, but it’s deeply insensitive of the Congressmember to compare them to the mass murder committed by the Nazi regime, especially in light of Holocaust Remembrance Day; and her comments do nothing to help us pass DACA or pass meaningful immigration reforms that keep families together,” he said in statement. We reached out to her Jewish affairs liaison Eli Slavin, who had no comment and referred us to the congresswoman’s press office. As of publication our calls and messages have not been returned. there are no best Democrats left, and Government money coming into the community is allocated to boondoggles. Can’t understand how Mr. Slavin can still represents that piece of garbage. You obviously don’t know Mr. “Opportunist” Slavin. need to see Canina Sperlin, etc., condemn her in the most harsh way. She is the smartest ANTI SEMITE around. She knows how to play her cards, and her Jewish people. Time to send her to the Gaza Strip, where she will feel at home. Yet, the voters keep on reelecting her. Schummer’s shutdown demonstrated that the Democr ats are not interested in a solution but only playing politics; and, second, they consider these illegal aliens to have more rights then citizens or those in the armed forces who protect this country. Why is Eli S. Still clowning g around with this rabid anti semite? Shame on Eli for embarrassing our community. Shame. Shame. Shame. Shame on you for calling on someone to quit his job in protest to no gain and possibly to some loss in comfortable anonymity. If you’ve a case to make in favor of Mr. Slavin leaving his position, then approach him and make it. I’ve never spoken to the man but see him all the time. It wouldn’t be too hard for you seek him out. PLEASE POST AN E-MAIL LISTING FOR HER FOR THOSE THAT WISH TO VOICE THIER OPINIONS ON HER COMMENTS. Eli slavin follows chaninas orders as does cohen, how can he work for an open anti Semite he is totally a sell out. He is a looser garbage and always was one. For any Jew, especially one who is religious, and especially a Chosid to tolerate this, is horrific. The Rebbe taught us to be proud to be a Jew. Sorry, but I don’t see anyone in the CHJCC or “leadership” showing any pride, at all, in this regard. There must be a “Mechoah” (protest) to this outrageous ranting and an apology from her. This foolish woman obviously has the IQ of a cat !!! Eli slavin was never a chossid never a mekusher never frum he’s a real …… Anshei Leobel etc. thats a very shver statement on another yid….. They are all somehow related, through marriage or business dealings. I’ll do for you and you pay me back and we will be happy, and who cares about everybody else and the community. I don’t usually post, but this time I can’t control myself. it was a good parnassa in those days……. Forest Gump’s papa knew just how to get the flames going – it sure paid off. Slavin it’s not someone who comes to the table with any brains just likes to be in photo ops. the bigger problem is chanina. they can’t help uphold the Rebbe’s directives of keeping the rent and property prices down either. 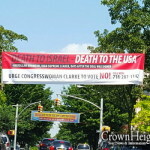 What are they doing to keep Crown Heights the Kan Tziva es haBrocha. we have to get our priorities straight here. That family charges the highest rents in CH. THE MINUTE SOME POLITICIAN ACTUALLY PROVES THAT HE IS A DECENT, HONORABLE, AND CARING PERSON ON BEHALF OF THE JEWISH PEOPLE, HE IS CALLED A DEROGATORY NAME! G-D PROTECT HIM AND MAY HE WIN AGAIN FOR THE BENEFIT OF MANKIND!!!! Remember: She also voted in favor of Obama’s “IRAN DEAL” only a few years ago. PS: Our other “supposed friend” Cory Booker (D – NJ, formerly close with Chabad of Oxford University once upon a time . . . ) also voted in favor of the same Obama “deal” with Iran. With friends like this, who needs enemies????? It was disrespectful, dishonorable, and if I had my way, I would compel you to step down from your role as a congresswoman. Someone who can spew such hateful comments does not deserve to serve in any capacity as an elected member of congress. We certainly do not all agree with the president, or do not agree with Washington’s policies all the time, but to say such despicable and disgusting comparisons is simply unforgivable, and you have shown your true colors, as a woman with no ethics or sense of decency. You pandered to the lowest elements of our society, and used that forum as an agenda to serve your own selfish gain. We can only hope that next election, should you run, and I hope you do not, a more fitting, respectful and honorable candidate will be elected in your place. Shame on you, Ms. Clarke. Stand up and act like a respectable human being and offer a public apology to the people of this city. And STOP INCITING HATRED. Only respond to this email if you have an apology to make. Otherwise, I do not want any correspondence with you. But if her “advisors” were really “Jewish”, they would have, in no uncertain terms, told her that her comments are hateful and disrespectful to the members of our community, whom SHE REPRESENTS. These advisors are an insult to Mordechi HaYehudi and all the defenders of our faith. She should be replaced and denounced for her anti-semitic, insensitive, pandering and insulting comments. We will replace her immediately! its time to start figuring out who is self-serving, and who is representing us according to the Rebbe’s directives. this has gone way too far. As far as this woman, she is inappropriate and needs to be told what a fool she is being.